Rob Warren on Rathole Radio! | Betty,TOO! Rob Warren on Rathole Radio! Rob Warren is a musician and one of the best friends of Betty. He is about to release his very first solo album. At Betty, TOO!, we will be stocking limited editions which come with posters exclusively designed. Meanwhile, you can already listen to some of the songs as well as an interview with the artist on Betty’s podcast The Time Is Now. Further more, we are thrilled as Rise, the song which the album is named after was already featured in another internet radio programme called Rathole Radio by Dan Lynch. So the words have already started spreading even before the release. As Dan mentioned during his programme, there will be a launch gig for the album at Betty, TOO! (The date to be confirmed. Likely to be mid August). Depending on the date of the gig, it may be broadcast live on Rathole Radio or there may be a live interview on the programme via Skype so it will be an interesting joint venture between Rathole Radio and Betty, TOO! as well! Actually, At Betty, TOO! we have been showing the bi-weekly Rathole Radio live and our own podcast The Time Is Now was produced after inspiration from Dan’s attempt to promote music under creative commons licence. So we are excited about this possible collaboration and working hard on it so that it will happen. In the past, I never thought of doing own our podcast or working with an artist to be a part of CD launch campaign but its all happening thanks to creative and ambitious people who are in the shop! 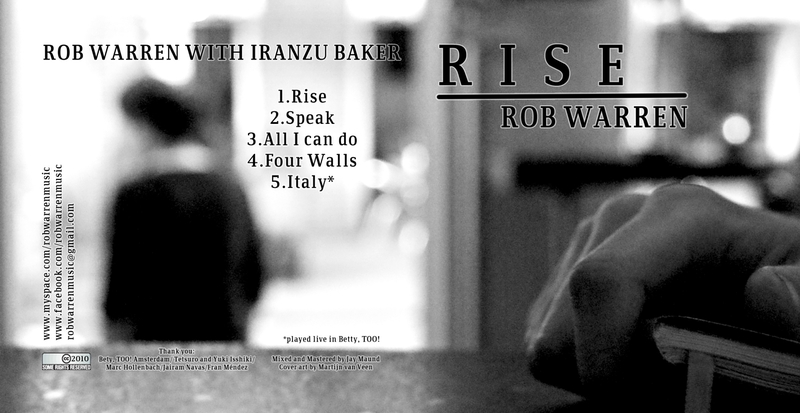 I have to be thankful that we all met at the right time and can work together…Please stay tuned on Rathole Radio as well as The Time Is Now for the latest on Rob Warrens new CD RISE and the launch gig! This entry was posted in Amsterdam, Betty, TOO!, creative commons, Events, Music, Podcast, rathole radio and tagged Amsterdam, Creative Commons, Events, Iranzu Baker, podcast, Rathole Radio, Rob Warren, The Time Is Now!. Bookmark the permalink. 1 Response to Rob Warren on Rathole Radio! Pingback: Bettys Podcast “The Time Is Now” | Betty,TOO!